Twitter has been a lot in the headlines in the past few months. From rumors of a possible acquisition to soaring share prices, followed by all major players backing off from the game, “Who will acquire Twitter?” intrigued the interest of one and all. But while everyone was busy making speculations and predicting future outcomes, one facet that never received enough attention amidst the frenzy was the Intellectual property owned by Twitter. Twitter’s patent portfolio was the least looked upon aspect by media. Patents, as we know them, play a major role in the success of an organization. If wisely leveraged, a patent portfolio could help an organization earn billions in royalties while serving as a defensive shield, protecting the in-house R&D efforts. Thus, it becomes paramount to evaluate whether the portfolio (that comes along in an acquisition) is a potential money-maker or not. But unlike other acquisition studies, Twitter’s patent angle was widely underlooked. Why? The Innovator’s Patent Agreement is one big reason behind the patent portfolio being undermined. The IPA, announced in a blog post dated April 17, 2012, is a move taken by Twitter to ensure that its patents aren’t used to impede other’s innovations. According to the IPA, Twitter pledged to not use its patents unless for defensive purposes; and if needed for offensive litigation, Twitter would have to seek the consent of the inventors (of the patent) prior asserting it. Further, to be completely enforceable, the IPA grants the inventors a license allowing them to grant non-exclusive sublicenses to a party being improperly sued by the company in violation of IPA. In simple terms, Twitter made sure that its patents could not be used offensively or “to impede innovation”, as they like to call it. Even in the case of an acquisition, according to the terms of the IPA, the corporation acquiring Twitter (or its patent portfolio) would inherit Twitter’s patents with the IPA intact. This would mean that though they may use Twitter’s patents for defensive purposes, they can’t assert those patents against anyone without the consent of the inventors. In an era where companies threaten lawsuits to monetize their portfolios, the IPA-laden patents would not be a big hit. After all, why would someone buy IP that can’t be used to make some licensing dollars? You agree, don’t you? Now, fact time! Fact: 95% of patents in Twitter’s portfolio are not and will not be covered under IPA. That’s right. It is commonly believed that all the patents in Twitter’s portfolio are covered under IPA. But that’s not really the case. Here’s why. Twitter’s portfolio of 1000+ patents is not purely organic. To be statistically correct, out of 1008 patents in its portfolio, only 52 applications (36 granted+ 16 applications awaiting issuance) were filed by Twitter staff. The rest of the lot were either bought to avoid lawsuits or were a part of acquisition deals. Before we delve deeper and uncover how IPA doesn’t affect 95% of Twitter’s portfolio, it would be interesting to go a little back in time to understand the reason it was introduced in the first place. Relevant Read: Which Strategy Xioami followed to Solve its Patent Portfolio Deficit? Though the history of patent wars traces back to 1908 (Wright brothers sued Glenn Curtis over infringement of Ailerons patent), the greatest patent wars of this century were fought from the onset of 2009. With the exponential growth in Smartphone industry, “Leverage your patents” became the mantra of every major technology company. Everyone sued everyone else for infringing on their patents and everyone else countersued. The entire industry was at war. Companies that had amassed large portfolios started acting like trolls and threatened everyone with a lawsuit (IBM is one of them). The “Patents hurts innovation” slogan started gaining momentum. It was the year 2012. The patent wars were at their peak. Patent portfolios became arsenals that every company used to emerge as victors. There were countersues, injunctions, product bans – basically, it was bloodshed (figuratively). IPA – A Move that could put an end to Chaos? Amidst the chaos, in the month of April, Twitter announced the Innovator’s Patent Agreement which came as a breeze of fresh air. Pledging to use its portfolio defensively, Twitter played a move that was appreciated by many, earning it some positive PR. In the same blog post, it was announced that the IPA was in its early stages and Twitter was reaching out to other companies to discuss IPA and whether those corporations would like to implement it or not. But no one followed suit. Companies were making millions out of licensing royalties and gaining the competitive edge by laying injunctions against each other. Why would they stop? So, they didn’t. Now let’s try to find out the kind of weapons (patents) Twitter had when the IPA was announced. A look at the patent filing statistics reveals that prior to the announcement, Twitter had 0 granted patents in its portfolio, though it had filed 6 applications pending grant. A relatively non-existent portfolio, yet a promise to honor IPA in all its future patents. From 0 to 1008: How Twitter amassed its portfolio? It was the year 2013. Twitter was growing as a company and as the next transition, it decided to go public. Three days before its IPO on November 6, IBM alleged Twitter of infringing 3 of its patents. Instead of going ahead with a lawsuit, both the companies agreed on a cross-licensing agreement; and for a whopping $36 million, Twitter bought 943 of IBM’s patents, to strengthen its defensive portfolio. Later in 2016, Twitter bought 10 patents from Allied Security Trust, a defensive patent holding company. According to patent assignment data, out of 10, 6 of these patents originally belonged to AT&T whereas 4 came from NCR Corporation. Among the rest, in addition to the internal patents filed by the Twitter staff, some patents were a result of acquisitions done by Twitter. If numbers are to be believed, Twitter has direct ownership of 12 patents as a result of acquisitions. IPA – Why you shouldn’t be worried? It was originally assumed that all the patents within Twitter’s portfolio, filed and acquired, would be covered under IPA. Fortunately, that’s not the case. Though all the internal patents, as promised by Twitter, do fall under the scope of IPA, patents acquired from IBM, Allied Security Trust or Metavana are not covered. According to the assignment documents, all the patents from IBM were transferred to Twitter on regular terms and a mere look at the document reveals that none of these patents were covered under IPA. Further, for an IPA to hold true, it has to be signed by the inventor to Twitter in order to transfer their rights to Twitter. Though this might not seem like a big deal when the internal team is involved, it is not a plausible move when patents are acquired from other corporations, where the inventors have already transferred their rights to their organization. The truth of the day is: IPA only covers 5% of Twitter’s accrued portfolio. This means that the remaining 95% of patents could indeed be leveraged to make royalty money. Now that we know, let’s try and understand the kind of portfolio Twitter owns. Relevant Read: Why 90% of Patents don’t make any Money for their owners? 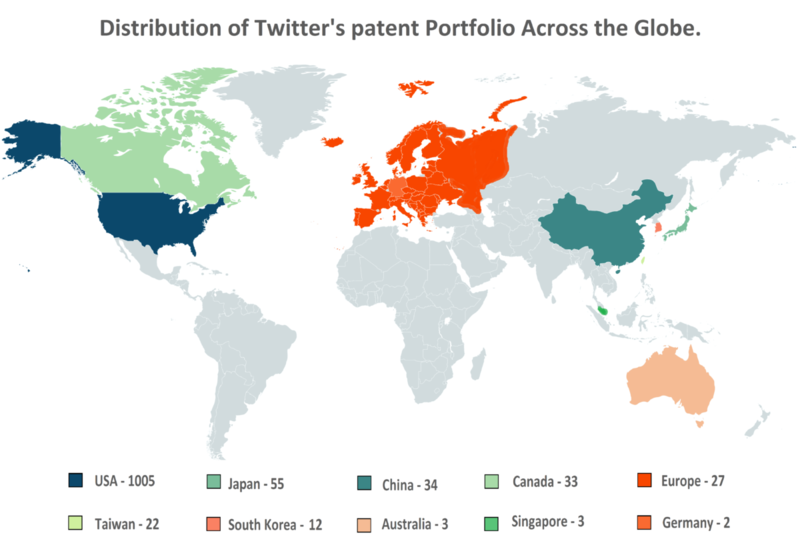 The 1008 patents in Twitter’s portfolio belong to 1006 patent families, spread across the globe, a majority of which are filed in the US, followed by Japan, China, Canada, and Europe. 943 from IBM, 10 from AST, 6 from Metavana and rest filed internally or as part of company acquisitions, we wondered – What kind of patents did Twitter have in its portfolio? To find answers, we classified patents based on IPC classification and found: 65% of patents in its portfolio were related to Digital Data Processing, while the remaining 35% constituted of patents belonging to several technologies – ranging from Semiconductor Devices to Data Processing Systems. Delving deep into the US patents in the portfolio, we found that Twitter had 986 issued patents whereas 19 awaited issuance. Out of 986 issued, only 4 patents were expired. It was interesting to note that leaving aside one patent that would expire by end of 2016, the huge patent family has a pretty good lifespan. According to our estimates, by 2026, though, 56% of twitter’s current portfolio would have expired. Knowing the fact that the portfolio has a good shelf life ahead, it’s time to evaluate how good the portfolio indeed is. 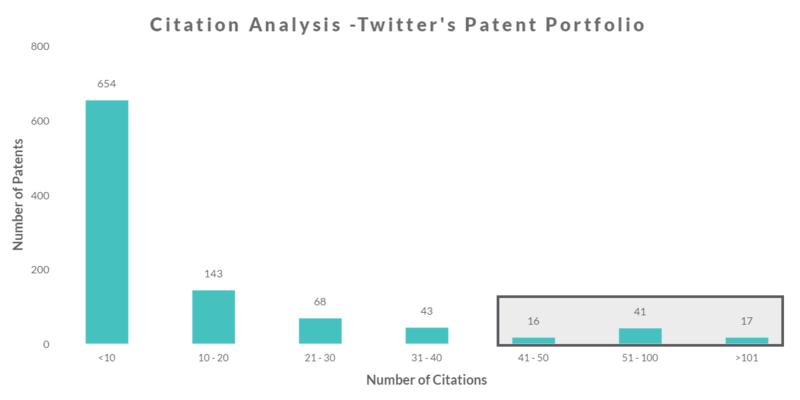 The citation analysis of Twitter’s portfolio revealed that 74 patents were cited by more than 40 patents each. Out of these 74, 17 patents had more than 101 forward citations. We believe that these patents are of crucial technology and could constitute the key patents in Twitter’s portfolio. Interesting fact: The patents with the highest number of forward citations in the Twitter portfolio is US6343324 with 1158 references. 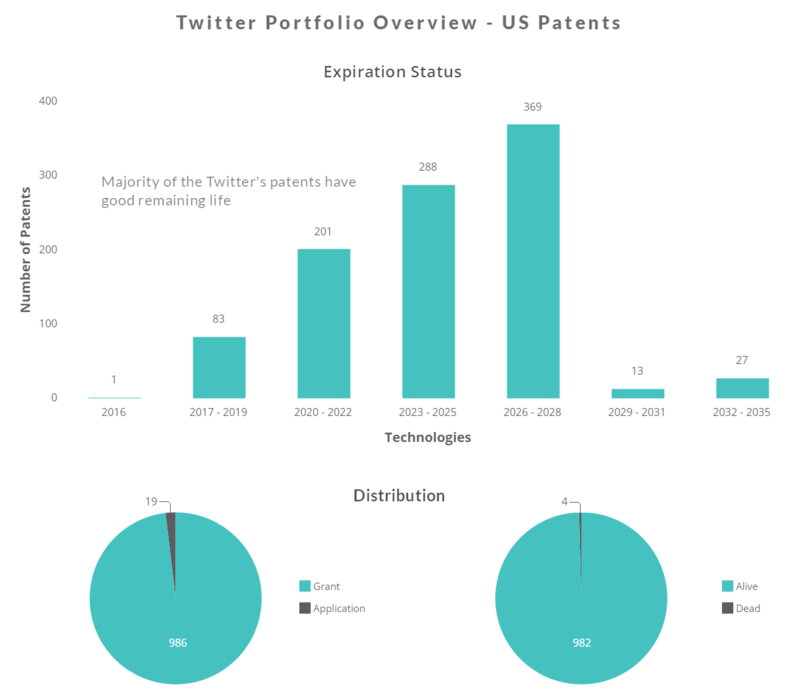 Is Twitter’s patent portfolio a money maker? Patents with a high litigation probability have higher monetization potential. To answer the above question, we examined the organization’s patents in our litigation prediction tool and found a pile of gold. According to our tool, 98 patents in Twitter’s portfolio had High litigation probability whereas another 100 had a good probability of litigation. The interesting fact to note here is that only 2 patents from the entire portfolio have been in litigation. For a portfolio with such litigation potential, using it solely for defensive purposes, not a very wise move! Having said that, to understand the portfolio better, we had a look at the top 50 patents in Twitter’s portfolio based on litigation potential. The patents ranging from data storage to processing, web services to markup languages and grid computing to code optimization were indeed a diverse mix, covering innovations from multiple technologies. But is it okay to be excited? 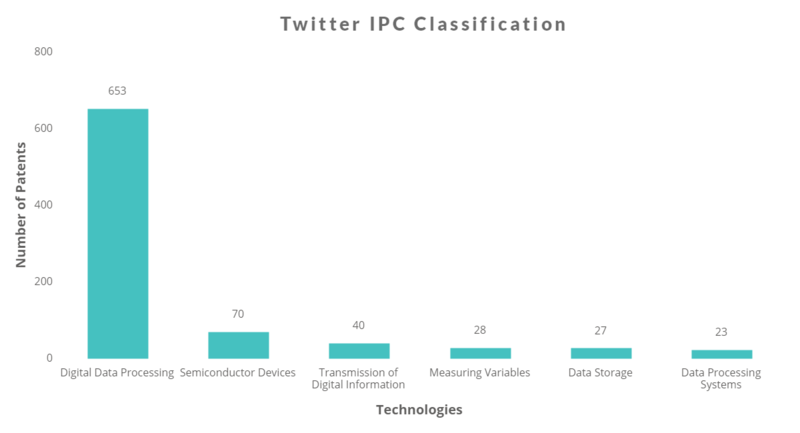 IPA covers all the patents filed by Twitter. Is the majority among the top 50 filed by the Twitter team? Among the 50 patents that have the highest litigation potential, 47 originally belonged to IBM, 1 to NCR, another to Tweetdeck(which was acquired by Twitter) and only one was filed by Twitter. Leaving aside the latter two, the remaining 48 patents are untouched by IPA, which means they have an excellent monetization potential. Side Note: Valuable Patents is our favorite combination of words. Recently, our team conducted a portfolio analysis of Qualcomm’s patents and found some gold among the pile. Click here to read the study. Alice based rejections- A Matter of worry? Alice based rejections are on the rise in the past few years. Having understood the pros, it is necessary that the cons are neither undermined. According to theory, patents that fall under art unit 3623, 3624, 3625, 3629, 3692, and 3693 are more likely to get nixed under Alice. 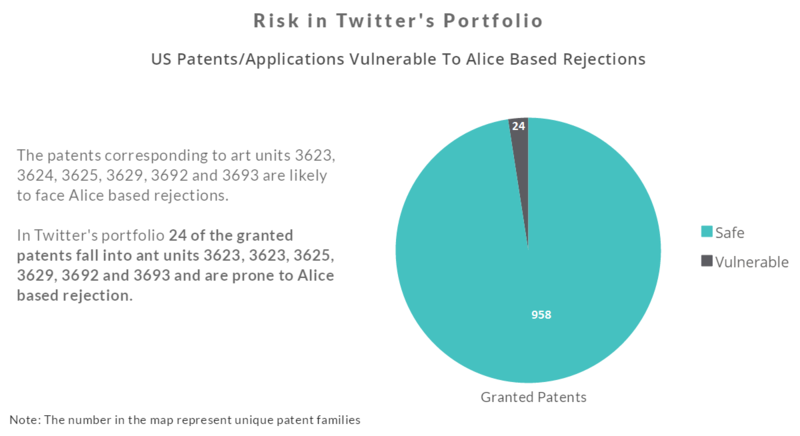 We segregated Twitter’s patents based on art units and found that 24 of the granted patents from Twitter’s portfolio were prone to Alice based rejection. This indicates that only 2.4% of the Twitter portfolio is at risk of getting invalidated under Alice. There is a huge list of pros and cons involved in buying Twitter. Troll haven, Marketer’s heaven, Active users, Brand identity, the list is endless. But amongst all other factors that we will leave other experts to determine, Twitter’s IP is certainly a feather in the cap. But if a company were to acquire Twitter’s IP, those patents can make some good money. No, we won’t comment on that aspect. There are 100s that did and none of those predictions came true. Major brands have already backed off from the game. Twitter is not a brand in a loss. All it needed was a change in strategy. And the folks back seem to have realized that. If reports are to be believed, Twitter is all set to go VR. In June 2016, Twitter acquired the video technology company Magic Pony and confirmed that it was putting together a team to lead the VR way under its machine learning arm, Cortex. Though there are no patent applications published yet, if Twitter does venture into VR, it will be a game changer. Further, on December 1, Twitter acquired Yes, Inc, which is a social apps developer company, with three social networking apps to its credit. Now, if we try to connect the dots, it does seem that Twitter might give a strong competition to its social networking rivals, provided it is first to win the VR race. Acquisition or no acquisition, one thing is clear: Twitter had understood the need to change its strategy and is taking necessary steps to make changes. The future does look bright. Rise and shine, Twitter. More power to you!